According to the latest Office of National Statistics wellbeing survey, the county of Hertfordshire rates above the national average in terms of people’s life satisfaction and happiness[i]. Located in the East of this beautiful county, Bishop’s Stortford is a historic market town, offering its residents the best of both worlds providing picturesque countryside living, coupled with excellent transport links into London. Well-known for its outstanding selection of high performing schools and vibrant market town setting, Bishop’s Stortford is popular among families. Following the success of previous development Albury Place in the sought-after town, premium housebuilders, GO Homes, has recently unveiled its exclusive collection of just five homes, Chantry Place. Carefully nestled in the countryside and overlooking the spire of St Michael’s Church, Chantry Place comprises a selection of five- and six-bedroom luxurious houses. The prestigious collection is ideal for families seeking a contemporary home, situated in a semi-rural retreat. The five and six-bedroom homes at Chantry Place have been thoughtfully crafted and boast the highest quality specifications throughout. The ground floor of the Kensington house type features a sleek and generously sized open-plan kitchen, dining and family room, promising the perfect space for entertaining family and guests. A separate living room and drawing room can also be found on this floor, as well as a utility room and an internal double garage. The first floor hosts all six bedrooms, three of which have connecting en-suites as well as a dressing room in the master bedroom. The homes also boast a range of smart features, including underfloor heating and electric car charging points. A historic, unspoilt market town, Bishop’s Stortford boasts a range of public amenities, including several GP surgeries, post office and large supermarkets such as Sainsbury’s and Tesco Superstore. There are also range of high street favourite shops in the Jackson Square Shopping Centre, including Accessorize, Next, H&M, Joules, Pandora and Starbucks, to name a few. A selection of restaurants and bars can be found on the doorstep, from local businesses such as the Prickly Pear, to popular chains such as Zizzi’s and Prezzo. For families, there are eight schools which have been voted ‘Outstanding’ by Ofsted located within three miles of Chantry Place. For younger children, Northgate and St Joseph’s Primary School are both under two miles away from the development. Older children will also benefit from a selection of well-rated schools nearby, including Hockerhill Anglo-European School, offering the International Baccalaureate, as well as Bishop’s Stortford College and The Hertfordshire & Essex High School and Science College. A rural enclave of connectivity, Chantry Place is just two miles away from Bishop’s Stortford train station and a five-minute drive. Benefitting from being on the Stansted Express line, commuters will enjoy swift journeys to London in only 35 minutes with direct trains to London Liverpool Street, served by the Central, Circle, Hammersmith & City and Metropolitan Line. By car, residents are equally as well-connected. Situated within the M11 corridor, homebuyers can connect to neighbouring towns such as Chelmsford and Cambridge in under 45 minutes. For jetsetters, Stansted Airport is only a short drive away. 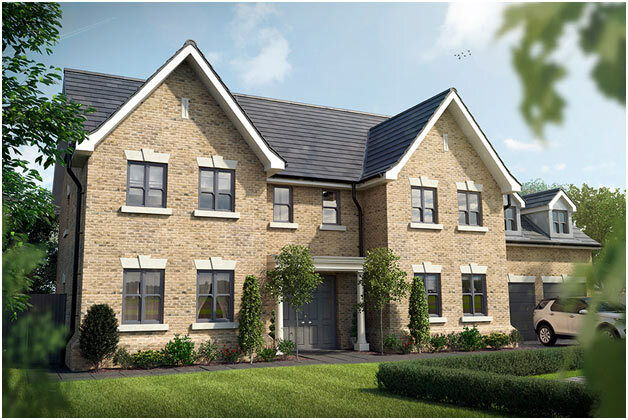 Homes at Chantry Place begin at £1,350,000 for a five-bedroom home. Go Homes will also be running a deposit paid incentive until 10th January 2019. For more information visit www.go-homes.co.uk or call 01279 600466 to arrange a viewing.